Yup, you read that correctly. 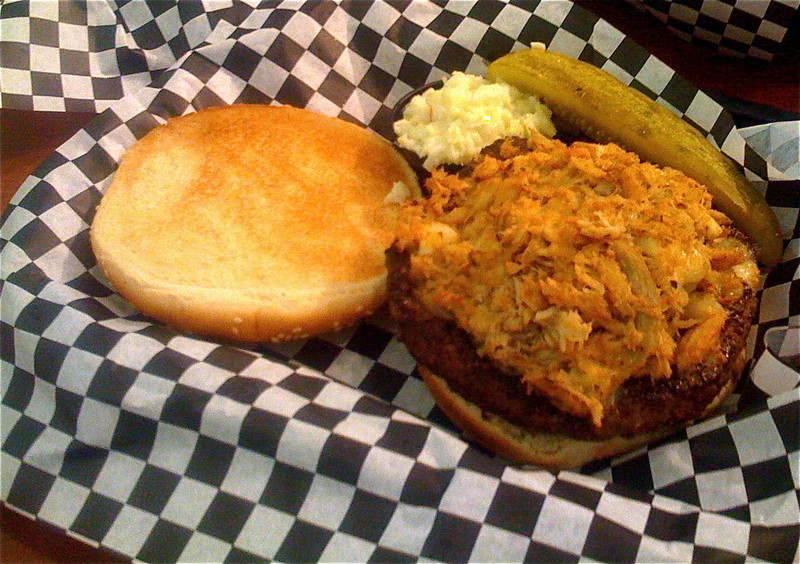 Crabmeat + Burger + Blue Cheese = !!! The Pop Shop is a great example of faux retro done right and the main reason is their menu. Creativity is key and one could pretty much take a blind stab at any dish on the menu and walk away thinking they just had one terrific meal. The burger is a one-half pound 100% Angus beef patty, served as you read above with a heaping dollop of crabmeat, blue and parmesan cheese. As you can see from the picture, this combination mixes nicely atop the burger and spreads evenly when squished down by the bun. Each bite is two treats in one, as the sweetness of the crab meets the deep beefiness of the burger. Never in a million years would I consider combining crab meat and burgers on my own at home, but whoever came up with this one was really on to something.